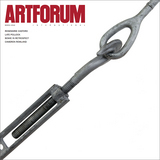 Nairy Baghramian, Chin Up, 2015, leather, epoxy resin, chromed steel, silicone, 9' 3 3/4" × 14' × 2'. Installation view. Photo: Diego Pérez. Nairy Baghramian’s first Mexican exhibition, “Hand Me Down,” reveals her ability not just to occupy but to play with space, rendering an institutional space intimate, bizarre, filling it with shards of bone or bits of organs that bring to mind bodies in a posthuman world. 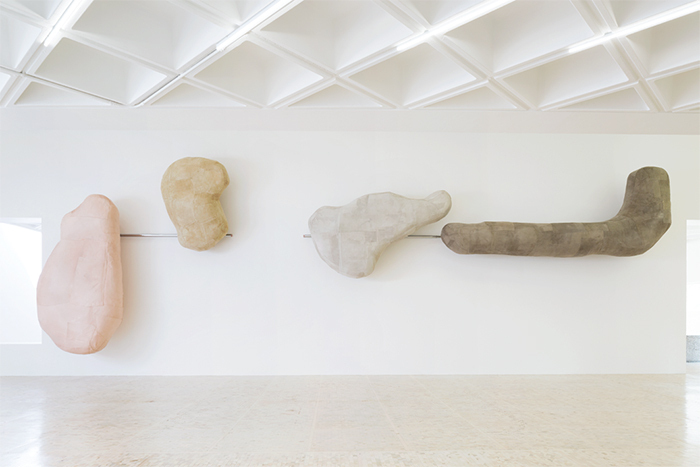 In this show, her work comprises three kinds of structures: five large, leather-covered resin sculptures in pale, dusty colors, hanging from the walls like lungs, chunks of brain, or soft prostheses, each titled Chin Up (all works 2015); bony, delicate, polished steel-and-silicone structures set on the floor like remnants of a cyborg whale, such as Jupon des corps (Body’s Underskirt); and white resin-and-plaster shells with chrome tubes that recall some kind of carapace, body armor, or shelter (Second Choices, Sample A; Second Choices, Sample B; Second Choices, Sample C; and Second Choices, Sample D).